Clary sage essential oil comes from the clary sage herb (Salvia sclarea). The flowering plant has a floral or herby aroma that is pleasantly inviting, and deeply soothing on the nervous system. As a medicinal herb, clary sage has a long history and is especially useful for women’s health and balancing hormones. It contains natural phytoestrogens that help deal with heavy menstrual cycles, hot flashes, and cramps. As a result, clary sage oil is one of the more helpful essential oils. Clary sage essential oil is known for its antispasmodic, astringent, antiseptic, antifungal, anticonvulsive, antidepressant, sedative, nerve tonic, and anti-inflammatory properties. It is also known for its ability to support digestion, increase circulation, improve skin health, and fight leukemia. The following article will help you learn about clary sage essential oil, and its many amazing benefits and uses. Clary sage is a perennial herb in the genus Salvia and is a close relative of the common garden sage. It grows from May to September and is native to the Northern Mediterranean, as well as certain areas in Central Asia and North Africa. The clary sage plant reaches four to five feet in height and has thick square stems covered in hairs. The flowers bloom in bunches, and its colors will range from white to pink, or pale mauve to lilac. Clary sage gets its name from the Latin word “clarus,” which translates as “clear.” In the Middle Ages, it was referred to as “clear eyes.” At that time, clary sage oil was used for vision and improving strained or tired eyes. Germans also refer clary sage seeds as “muscatel sage” due to its effect as a flavor enhancer for muscatel wine. Clary sage would also sometimes replace hops in beer and lead to an enhanced state of intoxication. In the 12th century, it was also used as an aphrodisiac. The key constituents in clary sage include alpha terpineol, sclareol, geraniol, linalool, linalyl acetate, neryl acetate, caryophyllene, germacrene-D, pinene, saponine, myrcene, phellandrene, and high concentrations of overall esters at around 72%. There are many unique health benefits of clary sage essential oil. For instance, clary sage oil contains an important ester called linalyl acetate—a natural phytochemical found in many spice plants and flowers. It helps regulate oil production on the skin and reduces skin inflammation. It also combines with jojoba oil to make a great skin moisturizer. Clary sage oil also boosts secretion of bile and gastric juices to help improve the digestive process and relieve symptoms like indigestion, bloating, cramping, and abdominal discomfort. It also relieves constipation, regulates bowel movements, and heals ulcers and wounds in the stomach. Other clary sage essential oil benefits include treating impotence, bronchitis, migraines, asthma, throat infections, and kidney disorders. Another major benefit of clary sage oil is its ability to balance hormones and promote women’s health problems. It is also great for stress, heart health, infections, and cancers. Read on for further detail about the health benefits of clary sage essential oil. Traditionally, clary sage oil was used for balancing hormones in women and regulating the menstrual cycle. It is used to treat premenstrual syndrome (PMS) symptoms, such as mood swings, cramps, bloating, and food cravings. A study published in the journal Evidence-Based Complementary and Alternative Medicine in 2012 found that essential oils like clary sage oil significantly reduced menstrual pain better than those taking the painkiller acetaminophen during the menstrual cycle of 55 high school girls. For the study, 32 subjects were divided into the aromatherapy massage group, while 23 were included in the acetaminophen group. The abdomen was massaged using marjoram, cinnamon, geranium, ginger, and clary sage oils in an almond oil base. The researchers then assessed the menstrual pain 24 hours later. The natural phytoestrogens in clary sage have an estrogenic effect on the hormones of the body. As a result, clary sage oil regulates estrogen levels, and improves the long-term health of the uterus and reduces the likelihood of ovarian, and uterine cancers. Since clary sage oil balances estrogen levels, it is a great oil for treating infertility, polycystic ovary syndrome (PCOS), and estrogen-based cancers like breast cancer. A study published in the Journal of Phytotherapy Research in 2014 found that inhalation of clary sage oil improves thyroid hormone levels. It also reduces cortisol levels by 36% in 22 post-menopausal women in their 50s, and some also diagnosed with depression. High cortisol levels are an indicator of depression. Clary sage also has the ability to open blood vessels and increase blood circulation. It also relaxes the brain and arteries, and therefore can naturally reduce blood pressure. A study published in the Journal of Alternative and Complementary Medicine in 2013 measured clary sage’s ability to reduce blood pressure in women with involuntary urination or urinary incontinence. The researchers found that clary sage oil significantly reduced systolic blood pressure compared with lavender oil and control groups. 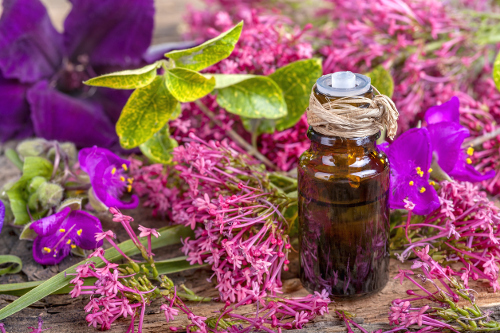 It also significantly reduced diastolic blood pressure compared to the lavender oil group, and significantly decreased respiratory rate compared with the control group. The anti-inflammatory and antioxidant effects of clary essential oil also help lower cholesterol and support the overall cardiovascular system. As an antidepressant, clary sage oil is one of the better essential oils for treating anxiety, as well as boosting mental health and confidence. A study published in the Journal of Ethnopharmacology in 2010 suggested that clary sage oil could be developed as a therapeutic agent for depression patients. The sedative effect of clary sage oil also promotes sleep and helps treat insomnia without the use of drugs. A study published in the journal Leukemia Research in 1999 examined the chemical sclareol found in clary sage essential oil and the role it plays in fighting leukemia. The results showed that sclareol killed leukemia cell lines through the process of apoptosis—also called programmed cell death. In vitro studies from 2007 also found that an isomer in clary sage oil called 13-epi-sclareol inhibits the growth of uterine and breast cancers. Clary sage oil can stop the growth and spread of fungal and bacterial infections. It can also stop bacteria from entering the body through food or water. The antibacterial properties of clary sage protect the intestines, colon, excretory system, and urinary tract. As an antiseptic, wounds will also not be affected when you apply clary sage oil to them. A study published in the journal Advances in Dermatology and Allergology in 2015 found that clary sage oil may treat wounds and skin infections due to its antimicrobial properties. Clary sage oil has a positive effect against active clinical strains isolated from wound infections, including Staphylococcus aureus, S. xylosus, and S. epidermidis. When purchasing clary sage essential oil, make sure you are getting a high-quality 100% therapeutic grade clary sage oil from a reputable company. You can find the oil at health food stores, or purchase it through recommended distributors of essential oil companies. Look for a clary sage oil product that says it’s from the genus Salvia sclarea, and it doesn’t include fillers or byproducts. Once purchased, you can create various beneficial essential oil combinations with clary sage oil. It blends well with wild orange, cypress, bergamot, rose, frankincense, vetiver, lavender, sandalwood, and geranium essential oils. The following are several specific ways you can use clary sage essential oil. Inhale or diffuse two to three drops of clary sage oil. Combine with Roman chamomile and add to bath water. Also, you can apply it to your pillow for a restful sleep. For cramps and pain relief, dilute five drops of clary sage oil with five drops of carrier oil, like coconut or jojoba oil. Massage into painful areas. Add two to three drops of clary sage oil to a warm, clean washcloth, and press over the eyes for 10 minutes. Combine clary sage oil with five drops of carrier oil. Apply it to the affected areas of the skin. Massage equal parts rosemary oil and clary sage oil into the scalp during a shower. Massage equal parts clary sage oil and carrier oil onto the abdomen, or use a hot compress with about five drops of clary sage essential oil. Combine four drops of clary sage oil with lavender oil, and massage the back or chest. The following are also a few clary sage essential oil recipes that combine other essential oils. Add all the essential oils to a five-milliliter dropper bottle. Shake vigorously to blend the oils together thoroughly. Let the blend sit for eight or more hours before using. Next, add 15 to 30 drops of this blend to your favorite carrier oil in a one-ounce bottle. Shake well, and use as a massage lubricant. Add all the essential oils to a five-milliliter colored-glass, dropper bottle. Close the cap tightly and vigorously shake the bottle to blend the oils together. Let the blend sit for eight or more hours before using. Dispense one to three drops on a cotton ball, and inhale for 10 to 15 seconds. You can also diffuse the formula into the air. When using on the nose, forehead, and back of the neck, combine 15 to 30 drops of the mood enhancer blend with your favorite carrier oil in a one-ounce bottle. Shake thoroughly before use. In a small ceramic bowl, combine Epsom and Celtic sea salts, baking soda, and your choice of clay. Add five to 12 drops of the essential oil blend to the salts, and thoroughly blend together. Add one to three cups of the bath salt oil formula to your bathtub filled with warm water. Soak for 20 to 30 minutes for a healing experience. After the soak, rinse off in a warm shower and towel dry. Then, wrap yourself in a robe, and rest for 10 to 15 minutes in a lounge chair, or lie down for a nap. Hydrate well during and after the bath. Although clary sage oil is a very beneficial essential oil, there are some things to consider before using it. For instance, use clary sage essential oil with caution during pregnancy, especially when using it on the abdomen or during the first trimester. Clary sage is known to cause uterine contractions that may be dangerous. Clary sage essential oil is also not for toddlers or infants. Some believe that clary sage oil can improve vision and protect against vision loss; however, not enough research suggests essential oils can be safely used in the eyes. So, be sure to discuss it with your ophthalmologist before using clary sage oil for that purpose. It is also a good idea to avoid using clary sage oil during or after alcohol use since reports indicate that this may lead to trouble sleeping and vivid dreams. Test clary sage oil for skin sensitivity by applying it to a small area of skin to make sure there isn’t a negative reaction when using it for topical use. Medications like hexobarbitone and chloral hydrate will also interact with clary sage oil and cause drowsiness and sleepiness, while increasing the effects of the medications. Essential Oils: All-natural remedies and recipes for your mind, body, and home (New York: Penguin Random House, 2016), 209, 229. Gentles Fite, V., Essential Oils for Healing: Over 400 All-Natural Recipes for Everyday Ailments (New York: St. Martin’s Griffin, 2016), 8, 27. Stiles, K.G., The Essential Oils: Complete Reference Guide (Selem: Page Street Publishing Co., 2017), 107-108, 164, 251, 291. “Clary Sage Essential Oil: Uses, Benefits, and Precautions,” Sustainable Baby Steps; http://www.sustainablebabysteps.com/clary-sage-oil.html, last accessed June 1, 2017. “Clary Sage,” Susun Weed; http://www.susunweed.com/Article_ClarySage.htm, last accessed June 1, 2017. “18 Amazing Benefits of Clary Sage Essential Oil,” Organic Facts; https://www.organicfacts.net/health-benefits/essential-oils/health-benefits-of-clary-sage-essential-oil.html, last accessed June 1, 2017. “Clary Sage Oil may Be Pricey, but Its Benefits Are Priceless,” Mercola, October 6, 2016; http://articles.mercola.com/herbal-oils/clary-sage-oil.aspx. “Clary sage essential oil information,” Esoteric Oils; http://essentialoils.co.za/essential-oils/clary-sage.htm, last accessed June 1, 2017. Hur, M.H., et al., “Aromatherapy massage on the abdomen for alleviating menstrual pain in high school girls: a preliminary controlled clinical study,” Evidence-Based Complementary and Alternative Medicine, 2012; 2012: 187163, doi: 10.1155/2012/187163. Lee, K.B., et al., “Changes in 5-hydroxytryptamine and cortisol plasma levels in menopausal women after inhalation of clary sage oil,” Phytotherapy Research, November 2014; 28(11): 1599-1605, doi: 10.1002/ptr.5163. Seol, G.H., et al., “Randomized controlled trial for Salvia sclarea or Lavandula angustifolia: differential effects on blood pressure in female patients with urinary incontinence undergoing urodynamic examination,” Journal of Alternative and Complementary Medicine, July 2013; 19(7): 664-670, doi: 10.1089/acm.2012.0148. Seol, G.H., et al., “Antidepressant-like effect of Salvia sclarea is explained by modulation of dopamine activities in rats,” Journal of Ethnopharmacology, July 6, 2010; 130(1): 187-190, doi: 10.1016/j.jep.2010.04.035. Dimas, K., et al., “The effect of sclareol on growth and cell cycle progression of human leukemic cell lines,” Leukemia Research, March 1999; 23(3): 217-234. https://www.ncbi.nlm.nih.gov/pubmed/10071073. Sienkiewicz, M., et al., “The effect of clary sage oil on staphylococci responsible for wound infections,” Postepy Dermatology and Allergology, February 2015; 32(1): 21-26, doi: 10.5114/pdia.2014.40957.